* Sorry folks! It would seem that even after close to a full year of blogging, I’ve still yet got into the habit of photo before food! Luckily, this time I remember to take a pic after I have stirred the dish. No bites were taken, I swear! Due to the recent good weather, the team I’m working in went out for lunch last Friday and I gladly tagged along. 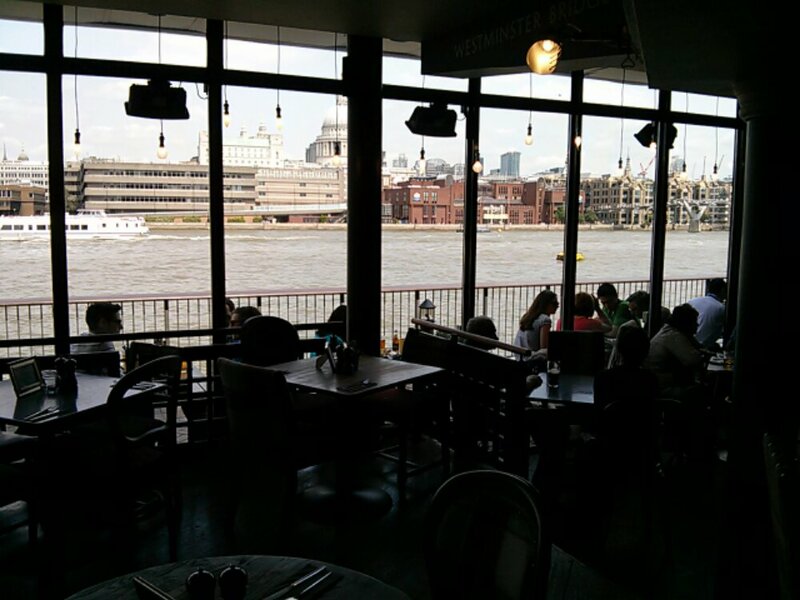 It’s normally a pub lunch on Fridays and the Scrum Master decided on a pub by the river. 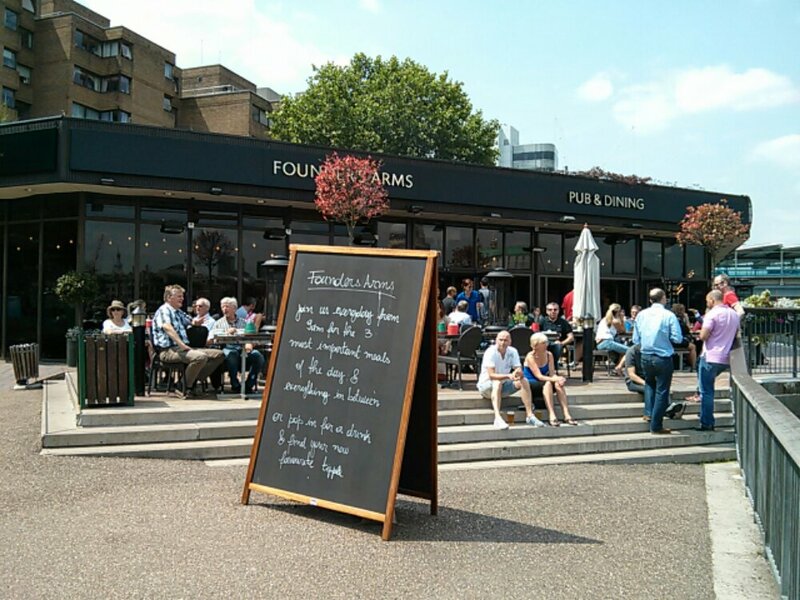 Founder’s Arm is located just down the bank from Tate Modern and we were all worried that it will be jammed packed due to the weather and the throng of tourist. We were not fussed whether where we were seated and luckily, the crowd we saw outside the pub while we were approaching was solely confined to the outdoor seating area. 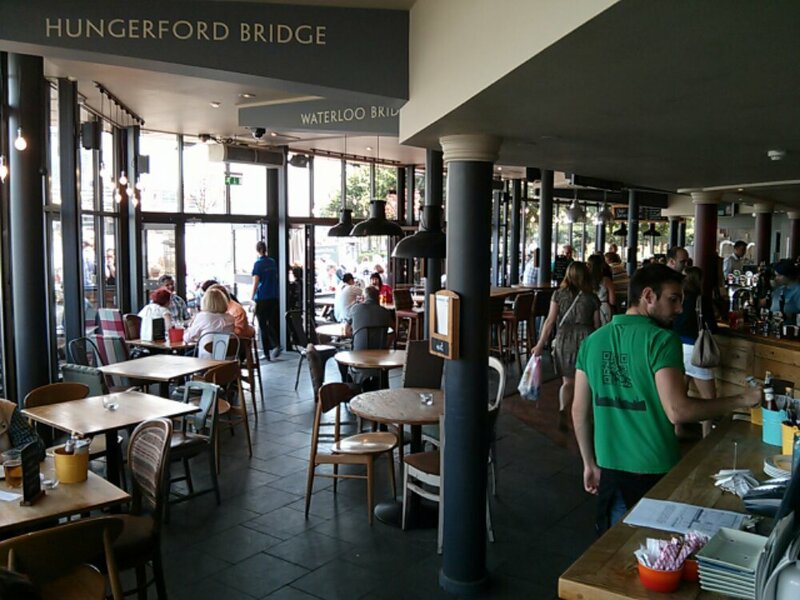 Inside the pub, there was plenty of empty tables available and the views are as impressive on the inside. 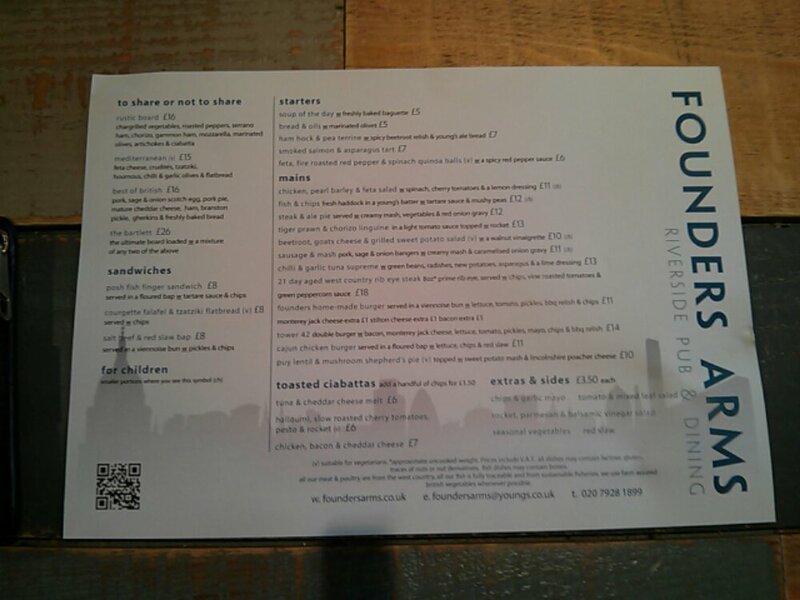 Apart from the menu, there is a daily specials board and the selection as expected is similar to your regular pub fare. Most of the team went with a burger of some form so I decided to break the monotony and went to the only pasta on the menu. I was probably tempted by the light tomato sauce which I thought will be refreshing on a hot day. At £13, I was expecting big tiger prawns. Alas, big prawns was not to be! I counted only 2 medium sized prawns in the pasta. As to whether they are tiger prawns, I can’t be sure since they were shelled and totally smothered in a rich and thick tomato sauce. The amount of chorizo pieces made up for the lacking of crustacean but they were there more for texture, unlike the smoky chorizo I love. 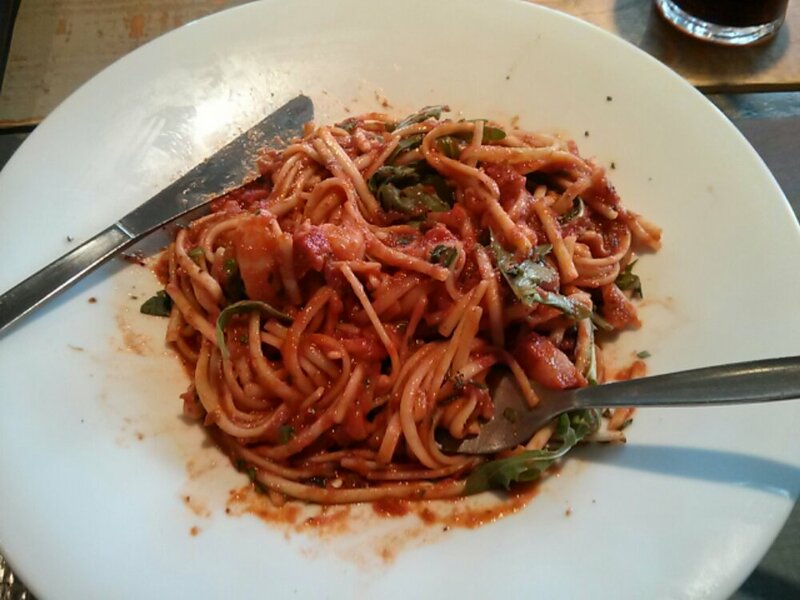 My main complaint was the linguine. I’m not sure how one can cook pasta such that they are mushy on the outside and yet still tough and grainy on the inside? Especially when the linguine is not a thick pasta. Baffling! 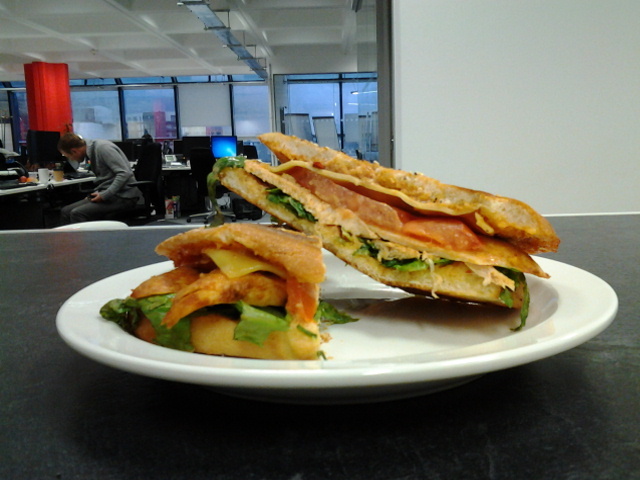 Yes, not a very good lunch I’m afraid, the only saving grace was the rocket which I’ve stirred in. Next time, I’ll stick to proper pub grub and not be the contrarian. 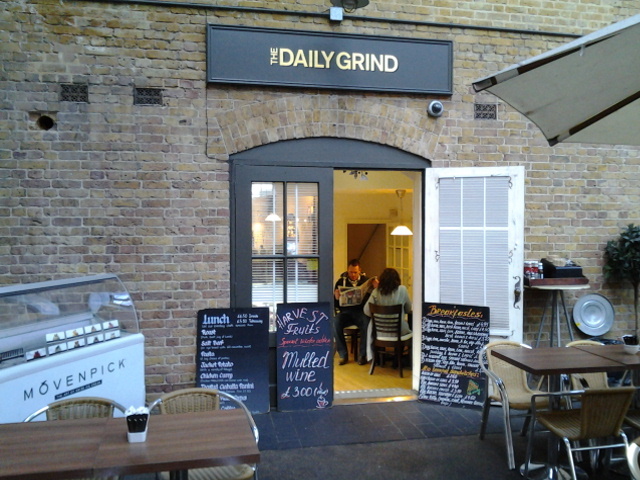 Found this small cafe inside Sackler Studio while wandering around the office area. 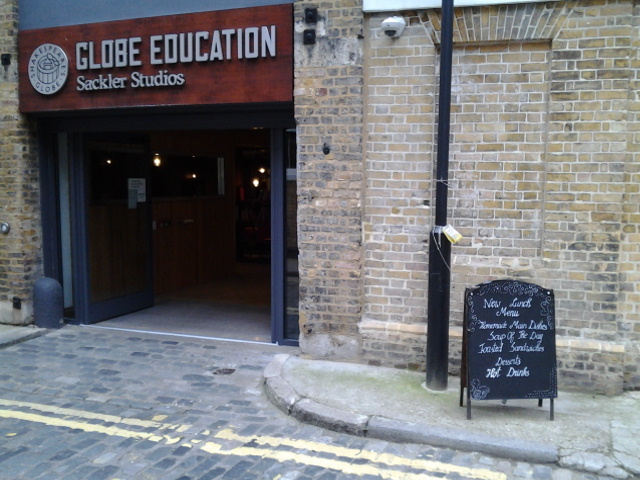 Sackler’s Studio is part of Shakespeare’s Globe Theater and the cafe can be accessed via Bear Gardens along Park Street. 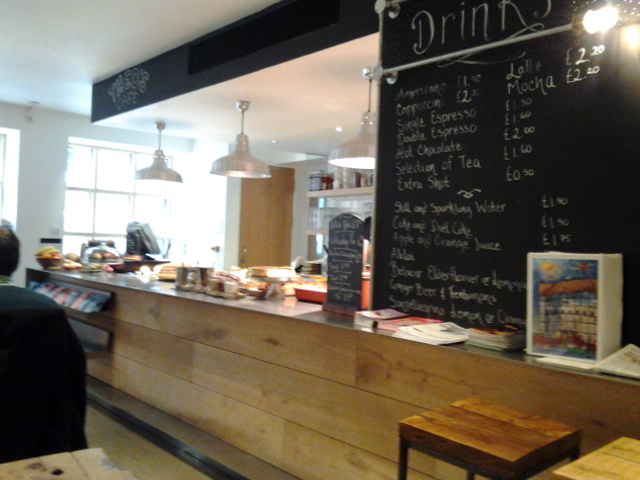 Theo’s Cafe serves breakfast and lunch as well as toasted sandwiches, snacks and cakes for your tea break. 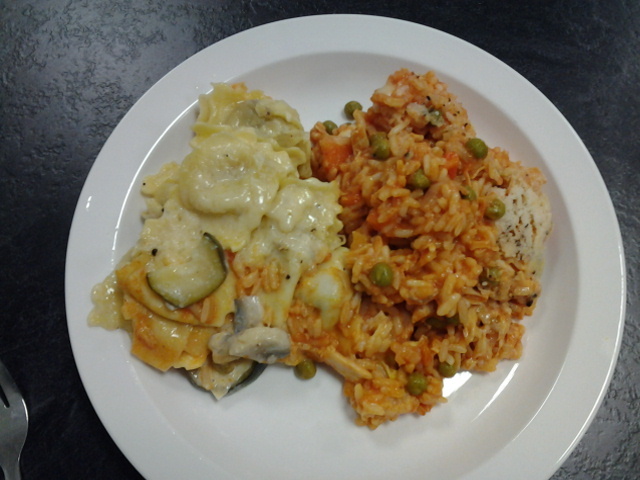 Today’s lunch choice included roast pollack, cottage pie, chicken lasagne and a chicken and mushroom pie. 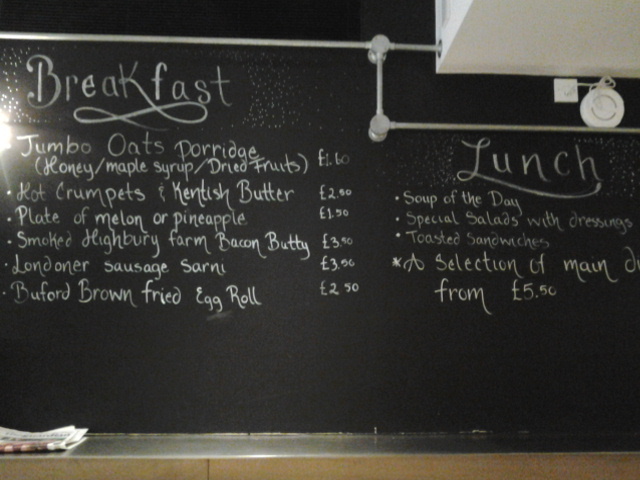 There is also a daily soup and a choice of salads. 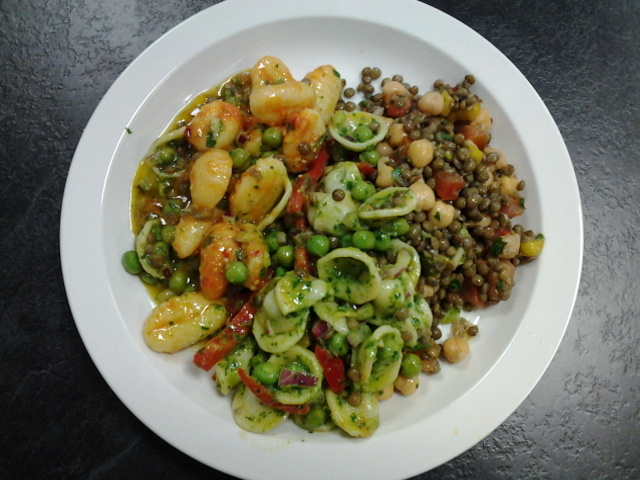 All mains comes with a choice of salads and starts from $5. 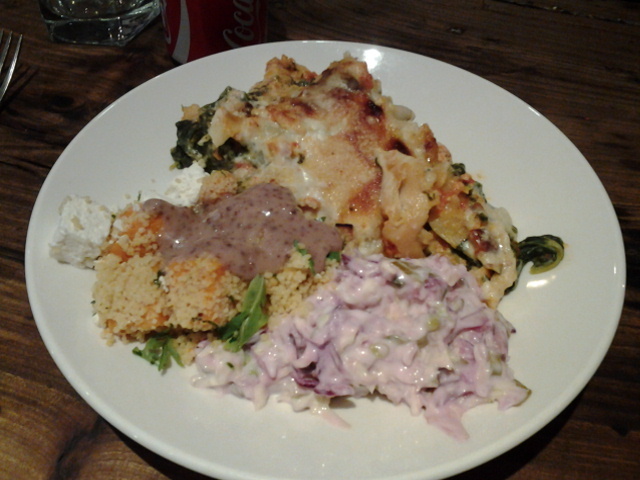 I went with the chicken lasagne with the couscous, roast squash and feta salad as well as the coleslaw. The lasagne was £6.50 and I threw in a can of Coke, total was £8. Though I love pasta, I’m have never really been a lasagne fan. 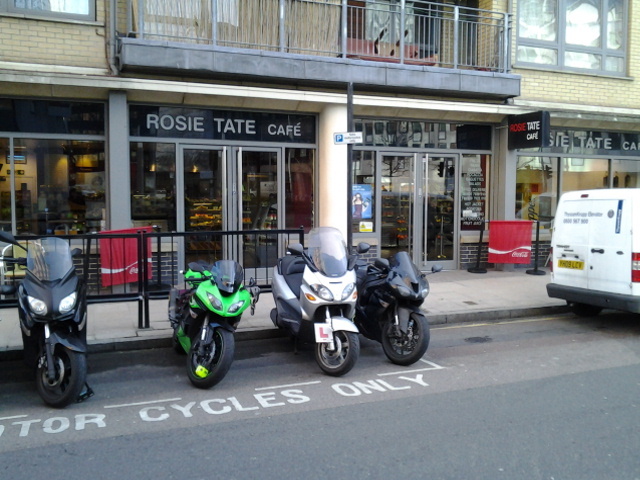 Not too sure why, perhaps most places serves a square of it which can look insubstantial for greedy Junk. But looks always deceived and I was stuffed to the brim after lunch today. First up the salads. The coleslaw was made with a combination of purple and regular cabbage with some sliced green beans throughout. The purple cabbage gave the salad a nice lilac shade which was visually pleasing but otherwise, it tastes like a normal coleslaw. The couscous, roasted squash and feta salad was something else. The combination of the sweet squash and the salty feta was a treat, would have been better if the squash and feta cubes were cut a tad smaller. 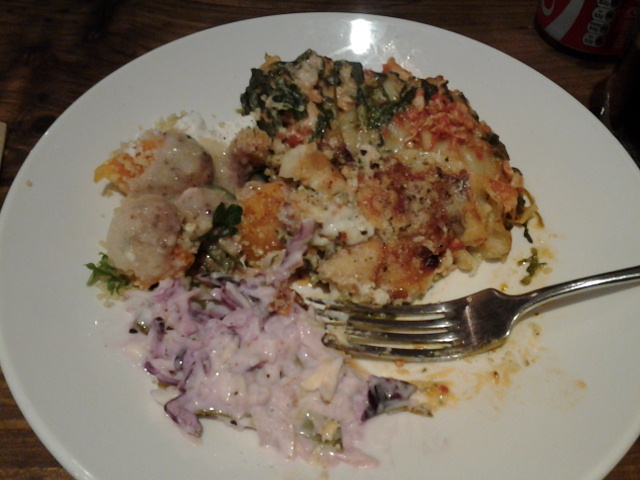 As for the lasagne, it was pretty darn tasty! The tomato sauce was not too strong with the bechamel and cheese sauce taking center stage. The generous portions of spinach layered throughout helped to cut down the richness and using minced chicken made much more sense than beef in this case. 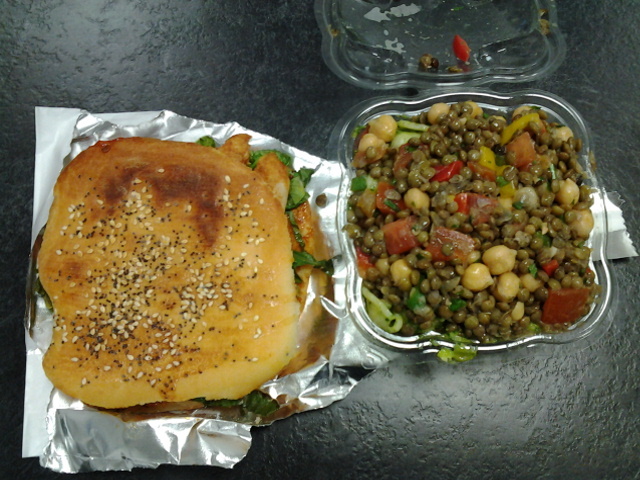 I’ll definitely be back to try other lunch specials at Theo’s Cafe. 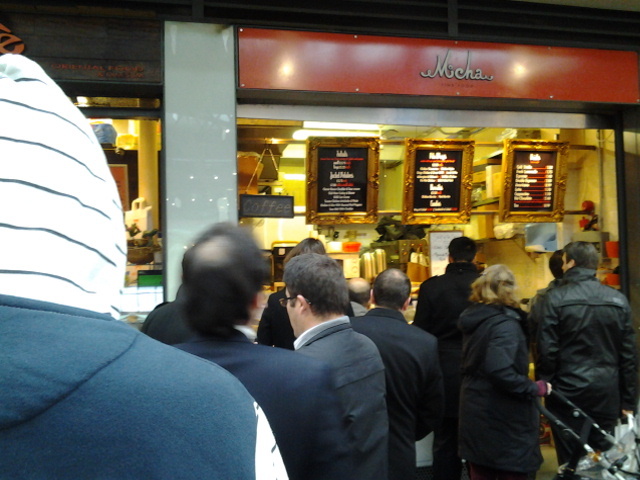 Though it’s Friday and Borough Market will be in full swing, somehow did not feel like getting lunch there. Passed by this cafe while walking to work and the offering looks good enough for a try. 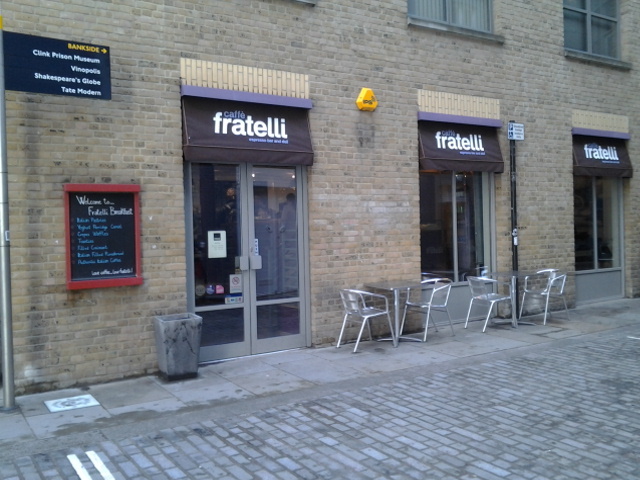 Caffe Fratelli is located next to the Clink Prison Museum and just around the corner from Borough Market. 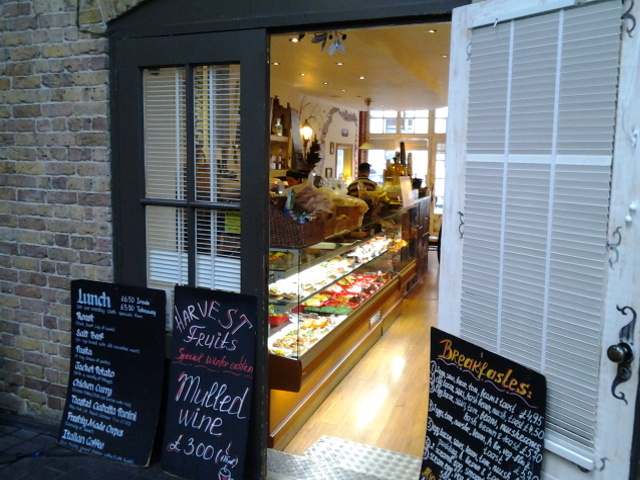 The cafe is bright and spacious and is a good place to rest your feet after sampling what Borough market has to offer. 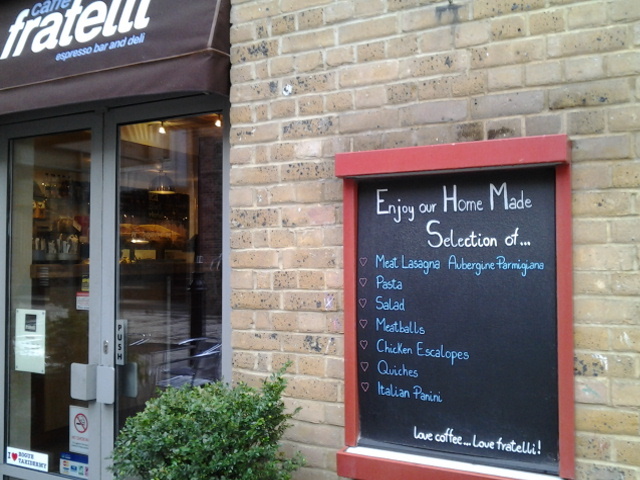 Looking at the signage, they serve both breakfast and lunch with the typical pasta and toasted sandwich varieties. 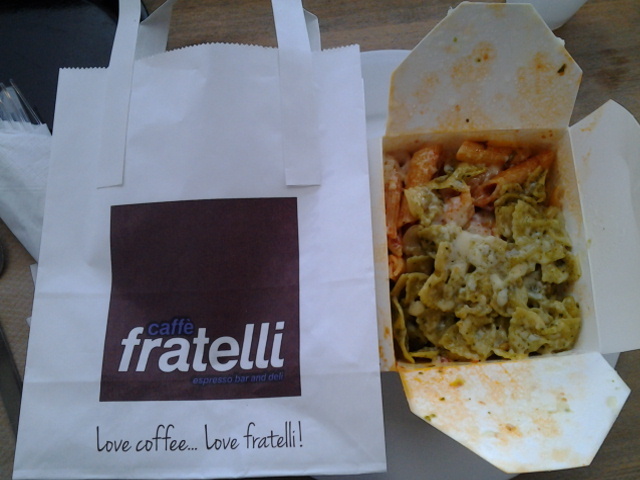 I decided to have a mix of the Pesto Farfalle and Chorizo Penne. 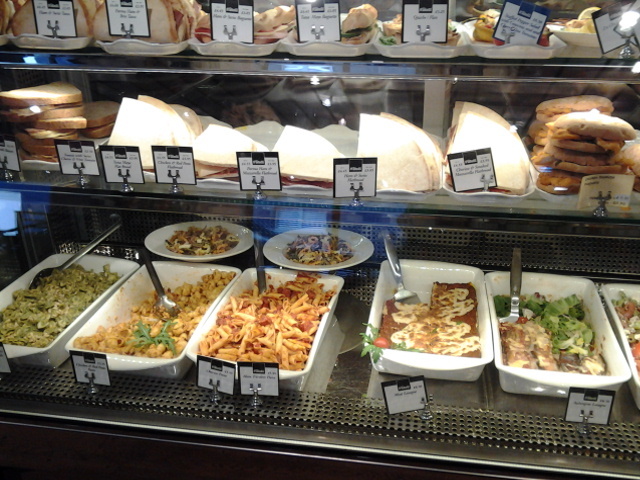 By itself, the farfalle would have cost £4.40 while the penne will be £5.55. I was charged the higher of the two which I didn’t really mind. Have to say I was disappointed with both pasta. The sprinkling of parmesan on top of both pasta melted and congealed by the time I’m back in office and stuck all the pasta pieces into a big lump. 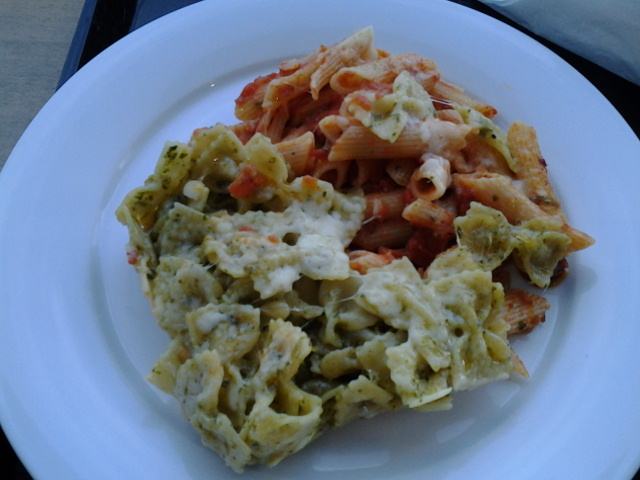 Though the farfalle is the right shade of green, there was hardly any taste of pesto and the pasta itself was tough and gummy. The penne fared slightly better. The tomato sauce is the right side of tangy while the small bits of chorizo is smoky and provides some chew as the penne in comparison was way over done. 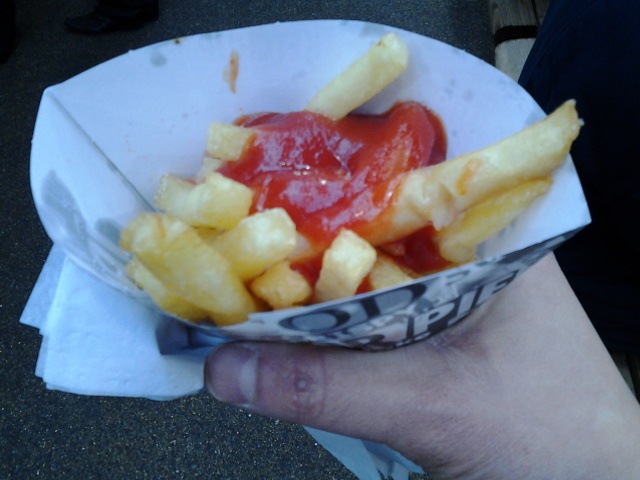 Seriously felt cheated having to pay £5.55 for it. Maybe the Chicken Escalope flatbread might salvage my impression of the place. But I doubt I will be back anytime soon. Refusing to accept that my lunch options is only confined to the vicinity of Borough Market, I went for a short walk yesterday when the sun was out. Started walking towards Tate Modern but not along the river banks and came across a rather new commercial development with the typical high street eateries but also some independent food outlets. My urge to blog has been ignited again! The Jubilee Line was delayed today due to some person stuck between the platform and the train at London Bridge. Wonder how that could happen as there is a glass gantry which separates the platform and the train at London Bridge. Anyway, London Bridge station was thus closed and had to get off one stop earlier at Southwark. 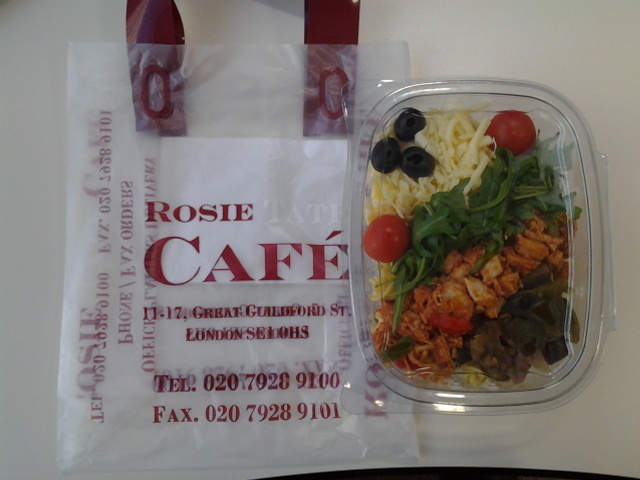 Knew I will pass by Rosie Tate Cafe on my walk to the office and decided to grab something for lunch. 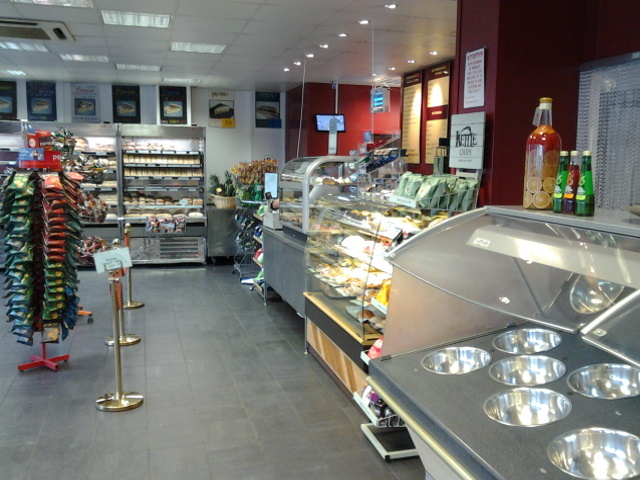 The cafe is very spacious with separate chillers for sandwiches, pick and mix salads and prepacked lunch boxes. Of the lunch boxes, there is a choice of Chinese rice and noodles, Caribbean style rice and choice of meat, some rice and curry as well as a range of salads. 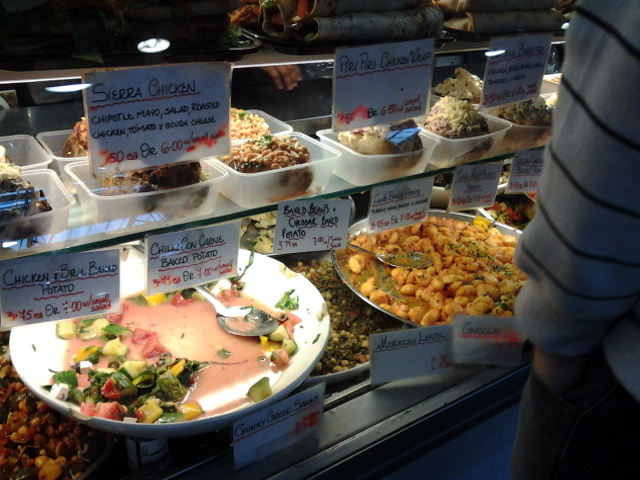 They are all reasonably priced with the rice and noodles between £4 – £5 while the salads cost slightly less. 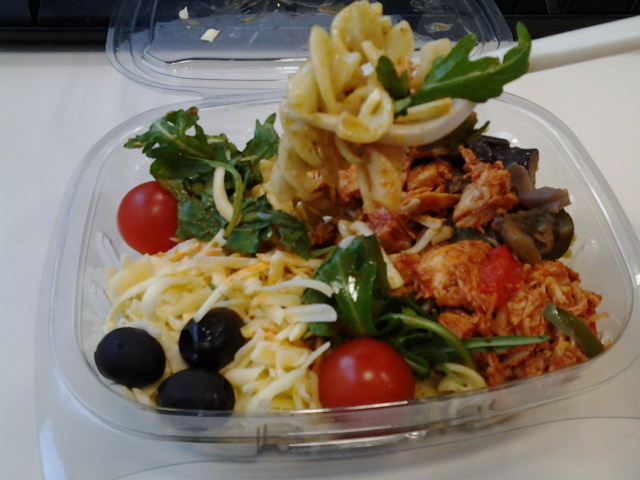 I decided on the Mediterranean Chicken Pasta Salad which cost only £3.25! Bargain! 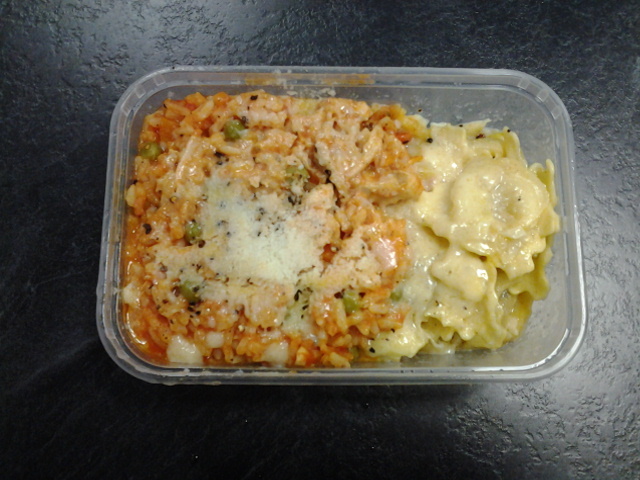 The fusilli pasta is lightly dressed with a pesto dressing and it is topped with shredded cheddar cheese, some black olives, cheery tomatoes, some shredded marinated chicken, rocket and a veg stew made up of courgettes, aubergines and mange tout. The portion was generous but to be honest, the salad is just what it is, nothing special. But for £3.25, how could you complain? Food craving is a funny thing. Sometimes you know what triggers an episode, perhaps you saw someone eating something or a recipe on TV. It could be triggered by weather changes, ice cream when it’s hot and comforting warm stew when it’s cold. More often than not, there are no origins to my craving, they just come out of the blue and usually it’s for very common foods. 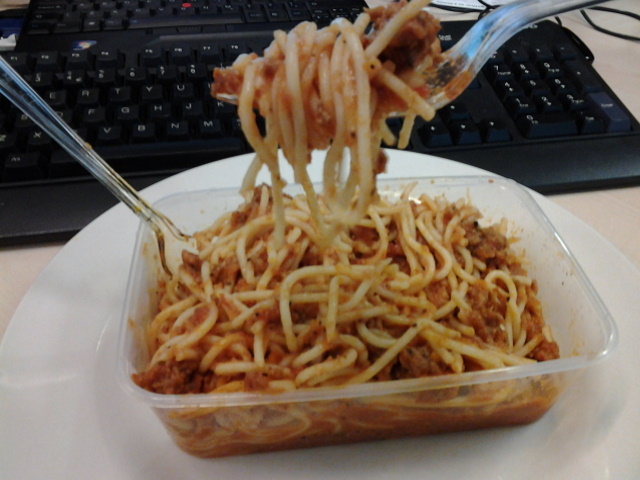 So I decided to satiate my craving for spag bol today. 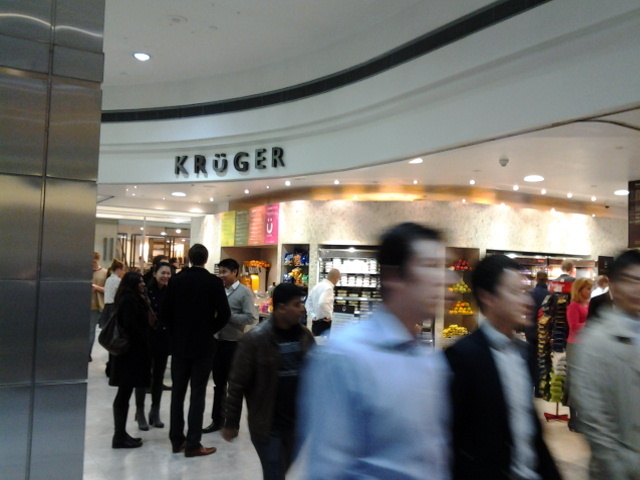 Kruger located in Canary Wharf focuses on takeaway meals for the folks working in the area. 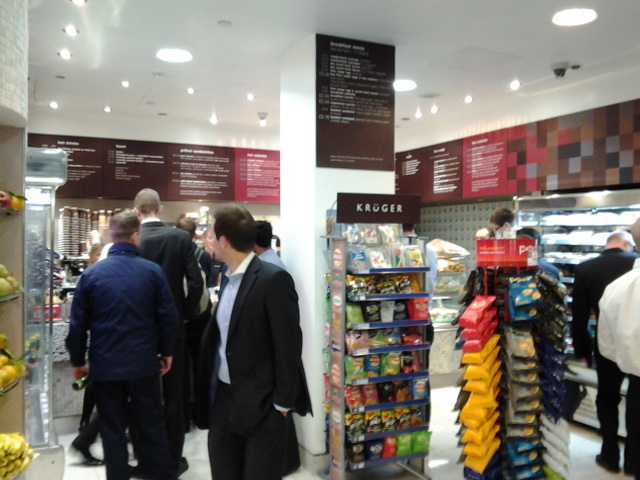 I know of a couple of other Kruger outlets, one near Moorgate and another near Cannon Street but the Canary Wharf one is different as it also has a eat-in cafe with it’s own menu. 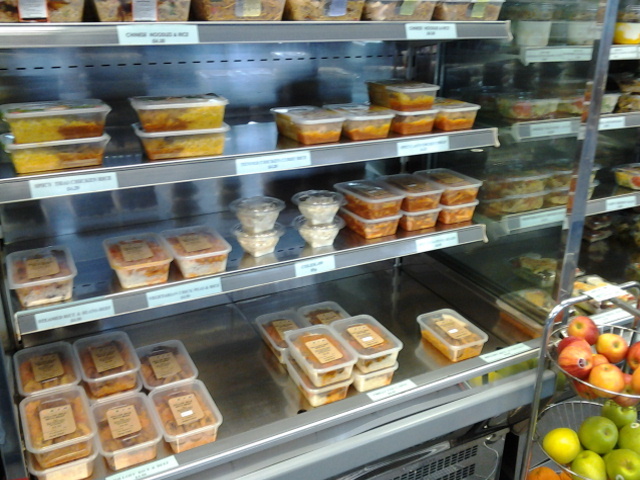 You will be spoil for choice at Kruger, anything from filled hot or cold sandwiches and wraps, salads, soups, ready made meals to orders from the hot kitchen. 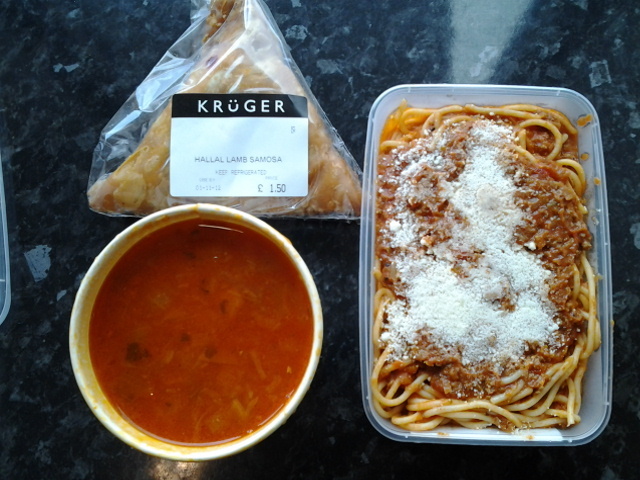 Since I was craving for spag bol, settled for the ready made meals from the fridge section. Also added a large Mix Seafood Soup and a lamb samosa which I will have after my gym session later. The pasta was £3, the soup another £3 and the samosa is £1.50. Feast for the gluttonous at £7.50, can’t complain about that! As the spag bol is pre-made, I was not surprised that the spaghetti is overcooked. Not al dente like it’s suppose to be. The bolognese sauce was pretty decent which was a surprise! 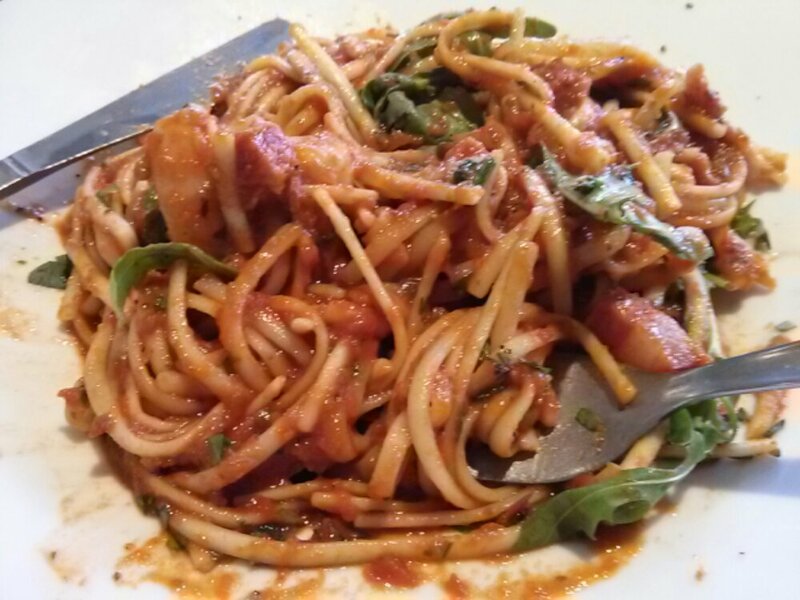 Thick, rich and meaty with a strong hint of bay leave, if only the pasta was cooked less. 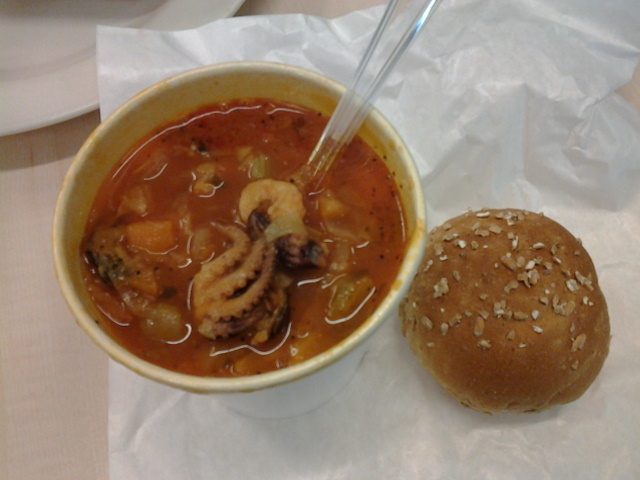 The winner of today’s lunch is definitely the Mix Seafood Soup. I was not too sure what I will get when I ordered and was delighted that it’s a bouillabaisse style soup. Generous pieces of squid, shrimp, mussels were scattered throughout, they are probably the frozen kind. The main body of the soup was made up of celery, carrots, onions and strongly spiced with cayenne pepper. Everything combined into a spicy but comforting meal. All soup comes with a bread roll which is a nice touch as most other placed charge extra from bread. Craving sorted and all together pretty satisfied.